The Hispanic population of the United States has increased dramatically, however the results of the last presidential elections leave doubts on the behavior of that electorate and on the influence of the Hispanic media in that electorate. The research focuses on a hinge state like North Carolina that had a special media impact by the electoral strategy of the Democratic Party. The methodology pivots on in-depth interviews, non-participant observation and analysis of political content of Hispanic media during the campaign. The results provide relevant information on the complex Hispanic media ecosystem and on the complex Hispanic electoral behavior. 1. Introduction. 1.1. Evolution of Hispanic media in the United States 2. Methodology. 3. Results. 4. Discussion and Conclusions 5. List of references. University: MA TESOL Reading University. The Hispanic population in the United States has increased progressively, from 14.7 million living in this country at the beginning of the of the 80’s decade the past century, until reaching 55.2 million in 2016, becoming 17.3% of the United States population (Stepler; Brown, 2016). The concentration of the Hispanic population in the State of California is outstanding, due to the proximity with Tijuana (Mexico), the most circulated border in the world. Although most are concentrated in the West coast, the migratory flow towards the East Coast has been increasing in the last decades. In the case of North Carolina (the State this research is essentially centered on), the Hispanic population comprises 8.95% of the total of almost 10 million individuals registered in the census, according to América FactFinder (based on the last updated census for the presidential elections of 2016). Mexicans are, by far, the collective of Hispanic origin with more relevance, representing 63% of that total of 55.2 million who live in the United States. Therefore, they constitute the main target of Hispanic media and for politicians wanting to gain their vote. The relevance of the Hispanic community compared to other communities such as Afro-American (43.587.193), Asian (19.167.716) or American Indian (5.309.095) is evident. 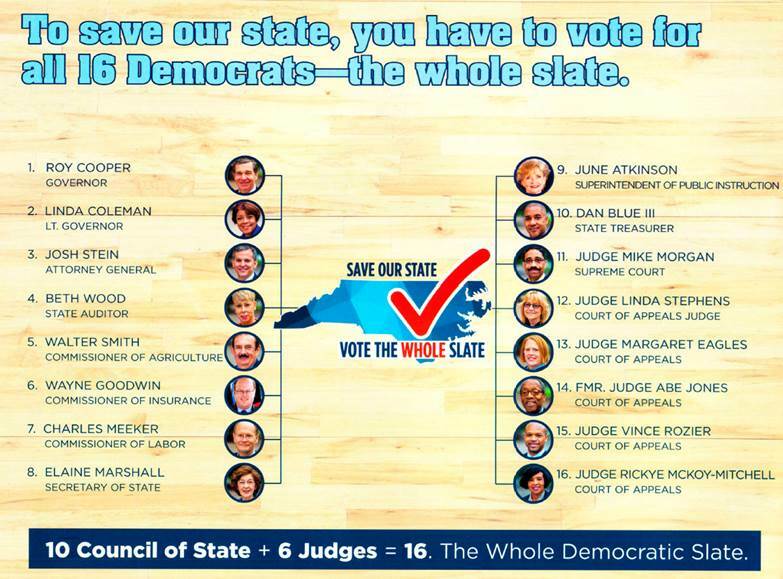 Therefore, in the elections of 2016 the Democratic Party, considering the constant disdains of the candidate Trump towards the Hispanic population, focused on the State of North Carolina, which distributed 15 electoral votes that might turn out to be key in a scenario of such equality. So much so, that the candidate Hillary Clinton, accompanied by former president Bill Clinton, closed the campaign in a mass ceremony in North Carolina State University, and previously, Obama himself was in two occasions in that State during the week prior to elections. Trump, on the other hand, did not perform any campaign in NC, even the Republican Party itself designed a campaign conveying preponderance to local leaders (governor, congressmen, senators and judges) and even the Party itself over the presidential candidate. According to Naleo, a total of 27.3 million Hispanics could vote in 2016 in the country, but only 16.2 million were registered (Telemundo, 2016). The candidate of the Democratic Party, Hillary Clinton, started the campaign #latinosconhillaryclinton to pull them towards organizations such as Mi familia vota and Consejo nacional de la raza. These summed up to the mobilization initiated by Hispanic media of national diffusion, such as Telemundo or Univision which clearly positioned in favor of the Democratic Party candidate. Ricardo Velásquez, lawyer specialized in migratory issues and president of the NCDP Hispanic American Caucus explained in a personal interview for this research that “for the first time, the Hispanic population vote can be decisive in elections and therefore we dedicated to gaining their support in a State such as North Carolina, where our forecasts indicate that results are very equal and the vote of our community can be decisive”. (Velásquez, first personal interview, November 7, 2016). The starting hypothesis is sustained in a triple reality, on one side, the growth of the Hispanic population, and on the other, the growth of the media for the Hispanic population and finally, the tacit support of the great majority of these media towards the Democratic Party, as indicated by experts interviewed and as reflected in the content analysis performed. We start from the hypothesis that said communicational reality would favor a triumph of Democrats in a key State such as North Carolina and in the country as a whole. A State that was decisive in 2008 elections with Obama’s Victory, and where a Democrat candidate hasn’t won since Jimmy Carter (González-Esteban, 2009:151). * Data of May 2004 to April 2016. Total includes other groups not reflected separately. Table nº 2: Table of voters by race in North Carolina. However, even though Clinton obtained 66% of the Hispanic population vote in 2016, she didn’t have all the support Obama had (71%) back in 2012 (Krogstad; López, 2016). Out of the 890.000 Hispanics that lived in North Carolina, based on the 2016 census, 265.948 could vote (older than 18 years old). Nevertheless, only 27.8% voted, significantly below the national average of Hispanic population that voted and which represented 46.1% (López; Stepler: 2016). That is, the hinge State of North Carolina was one of those in which the Hispanic population voted less. Some local analysts considered that this low participation is due to Obama’s migratory policies, with thousands of deportations during his mandates, and the idiosyncrasy of the Hispanic population itself once a specific stability social status is achieved (Gergen, C. and Martin, S.: 2016). Likewise, other scientific studies demonstrate the potential the Hispanic vote will have in 2032, with an increase of 129% in NC, the most elevated in the United States, due to the thousands of youth registered in the census in that State (Yee, 2016: 4). This situation justifies the object of study and allows opening a future research line based on the evolution of that State. The scientific literature has been managing this phenomenon of analytical-descriptive observation which is the foundation of this research, and the review of media, messages and campaigns throughout the recent electoral history of the United States, confirming the interest for gaining the immigrant vote in the United States (Araújo, 2012:71). Said observation allowed us to confirm an unprecedented mediatic mobilization against the Republican candidate, as example some advertisements in Spanish broadcast in local televisions, which study was made by the Political Communication Lab de Stanford University (2016) itself. On November 8, 2016, Donald Trump obtained and tight victory in North Carolina (50.5%), with 2.3 million votes, compared to 2.1 million (46.7%) of Hillary Clinton, and 127.794 (2.8%) of the former Republican and leader of the Libertarian Party, Gary Johnson. 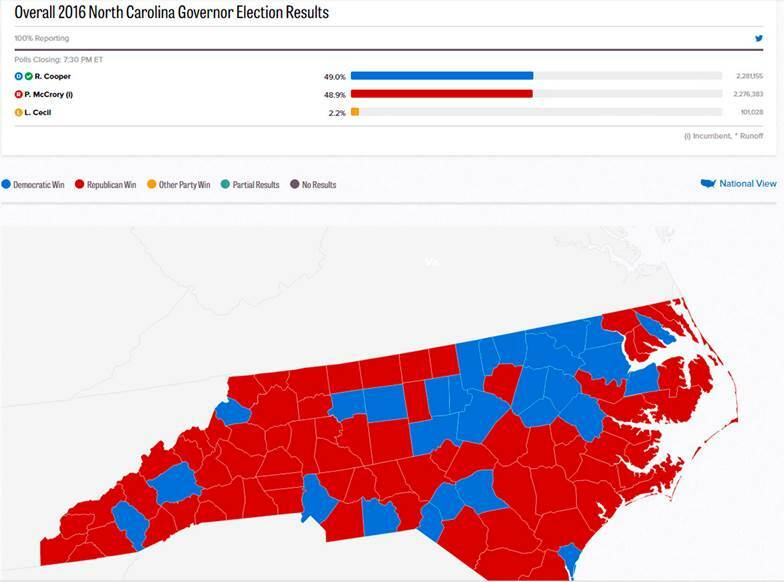 The results in the elections for legislators (Congress and Senate) reproduced very similar behaviors to those for presidential elections, while the only victory of Democrats was in the election for Governor of the State of North Carolina, where the Democrat candidate, Roy Cooper, won by a narrow margin of 4.772 votes, 49.0% compared to 48.9% of the Republican, Pat McCrory. The Hispanic media have increased their presence in the United States progressively. Due to the demographic increase of the Hispanic community, the demand for information in Spanish has increased simultaneously as well. The first reference to a Spanish media is dated back to 1808 with the headline of El Misisipí from Nueva Orleans. Hispanic media have differentiated from Anglo-Saxon traditional media since its origins, not only becoming information channels, but also instruments for leadership and mobilization for the Hispanic community regarding social, political, religious activism, etc. (Gutiérrez, 2011: 105,106). Anglo-Saxon media dedicate space to a community as numerous as the Hispanic solely due to commercial reasons and news have the white English-speaker perspective. Therefore, this is the gap Latin media fill with an approach born from the Hispanic-speaker identity itself (Gutiérrez, 2011). According to Shearer (2016), we can confirm that the research about the evolution of media for Hispanic population starts gaining certain relevance in the United States. Between traditional press, weekly newspapers, radio, websites, televisions, Hispavox calculates that currently about 400 media for the Hispanic population in the country are active, although there is no rigorous monitoring of many of them, that cannot be considered professional. Shearer’s research (2016) indicates the boost of niche media for the Hispanic population, coexisting large corporations such as Univisión, broadcasting countrywide, together with local media that have also occupied an important sector of the market. The negative aspect is related to advertisement incomes, declining in the traditional press, the loss of job positions in that same traditional press, the discrete loss of listeners in radio broadcast for Hispanic population and in the quality of job positions some new online media generate. Professional journalists such as Eloy Tuchipan, with more than 20 years’ experience on Hispanic media such as Qué Pasa Noticias or Mundo Hispánico, believes that the “quality of media depends on the preparation of well-educated professional journalists to work in a very competitive bilingual market” (Tuchipan, personal interview, November 9, 2016). The challenge for many Hispanic scholars and professionals settled in the United States goes through “dignifying” these niche media; that they could be as innovative and technologically advanced as possible. According to Casero-Ripollés (2017), “the digital environment makes the production of political information easy, fast and cheap”, and in some universities there is a bet on strengthening innovative digital professional profiles allowing to improve the quality of media for the Hispanic population, it is the case of the first minor of journalism in Spanish in the United states, offered by the California State University of Northridge and which is completed with the CUNY post-graduate studies, a Master’s degree of journalism in Spanish. The scientific literature has also been interested in studying the strength and relevance of these media “that have played an essential role in mobilizing millions of migrants in defending interests of Mexicans settled in the United States, besides generating and widening networks of leaders and activists of migrant’s organizations” (Ayón, 2010:140). In short, the starting hypothesis coincided with the surveys of most of media, included the ones published by the media object of study, besides the internal surveys managed by the Democratic Party of North Carolina. From this hypothesis we propose the essential objective of observing, knowing and delving in the communicative fact and in the relationship of said fact with electoral results in the State of NC, always focusing in the Hispanic community. For this research we have used both qualitative and quantitative techniques. Regarding qualitative techniques, we have followed the line developed by the Mapcom project, which combines in-depth interview and non-participant observation with content analysis (Piñuel; Sánchez-Carrión; Peñafiel; et al., 2016). 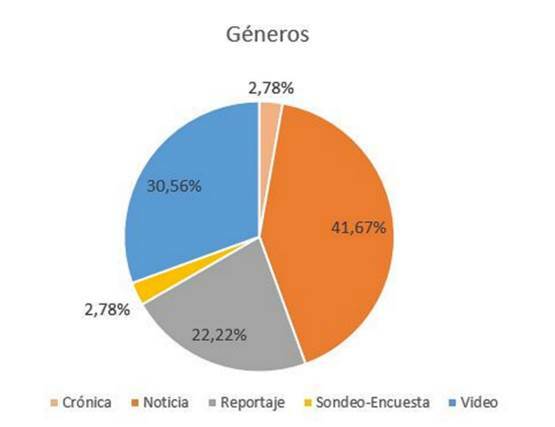 Regarding the quantitative methodology, we have performed a content analysis (Bardin, 1996) about two media models for Hispanic population: one with coverage countrywide, like Univisión’s case, and another one specific for North Carolina, such as Qué Pasa Noticias. Qué Pasa Noticias is the first Hispanic media in North Carolina. It has an important presence on social networks and has been granted different awards, including the best weekly Hispanic newspaper in 2013. It is part of the group Latino Communications, reaching an audience superior to 180.000 Hispanics through its branches in Charlotte, Raleigh, Durham, Greensboro and Winston-Salem. According to Pr Newswire, Univision Communications Inc is the most relevant group of Hispanic media in the United States, reaching 81 million single consumers per month. The chain Univisión is among the five chains of most prime time audience and surpasses all entertainment chains in cable TV in English. The debate of Democrat candidates for Presidency produced by Univisión also had more Hispanic viewers than other debates of Republican or Democrat candidates in the rest of chains in the electoral campaign. The sample consists of 35 news units from both media. Exclusively selecting the ones published in the section of politics during the last week of electoral campaign (from November 1 to November, 8). We consider that the information during this period of time is key for the decision making process of many citizens, especially in a State where results were foreseen as very adjusted, just as it finally happened. The coding includes 22 variables, such as: the number of appearances of candidates (Clinton and Trump); treatment given to information (positive, negative and neutral); the journalistic genre (news, report, interview, column, survey or video); authors/source (journalist, editorial, agency, other media and social networks); talked about themes; whether there is relationship with the electoral campaign and if there appear images or videos of the candidate. When it comes to stablishing the neutral, positive or negative evaluation of the candidate, we considered: whether there were facts or data without any kind of interpretative load, nor headlines focused on favoring or prejudicing one candidate or the other. We analyzed interpretative texts or headlines that allowed to determine the support or rejection of candidates. Regarding qualitative techniques, we have performed in-depth interviews and non-participant observation. The paper is supported on six face to face, in-depth interviews, structured from the hypothesis and objectives of the research proposed. According to Bernardo Robles (2011), the selection of respondents profiles is essential as well as the previous documentation task. In this sense, we chose two journalists of Hispanic origin (Peruvian and Mexican) with a wide professional experience in media for Hispanic population in the United States. In the case of the journalist Eloy Tuichipan, he is a professional with more than 20 years’ experience in media for Hispanic population, first in Qué Pasa Noticias and currently in Mundo Hispánico, online media belonging to Cox Media Group, with headquarters in Atlanta and today with ten branches throughout the country, including one in Charlotte (North Carolina). The other practicing journalist interviewed is Guadalupe Lizárraga, with a broad background in the field of journalistic research in border areas of United States and Mexico, and currently editor of the online media Los Ángeles Press, with headquarters in San Diego and Los Angeles. The interviews’ sample includes a North American professor of Political Communication expert in electoral processes such as Dan Hallin and scholar of electoral behavior of the Hispanic population in the United States during the last decades. In Hallin’s case, we had the opportunity to interview him personally in the University of California-San Diego, before elections, and also talked to him in the Seminar on Political Communication, held in Universidad de Valencia, after elections. Other interviews relevant for the research were the ones made to Ricardo Velásquez, lawyer and president of Hispanic Caucus from NCPD; politician of Hispanic origin (double interview on November 7 and November 9) who, additionally, was responsible of coordinating the non-participant observation and of scheduling another interview with the president of NCPD in Raleigh, Patsee Keever. The interviews were conducted between November 4 and 10, 2017 in San Diego, San Antonio and Raleigh (United States), and the average duration of each interview was one hour. Considering that one of the basis of this research were in-depth interviews, a previous task of planning and preparation was essential. Respondents received information about the issues to be talked about, specific based on their professional profiles, and from there, a twenty questions survey was elaborated, although the development of the interviews allowed to re-ask and introduce issues of interest for the research that came up during the conversation. The interviews were recorded in audio format and attached completely as annexes for this paper. 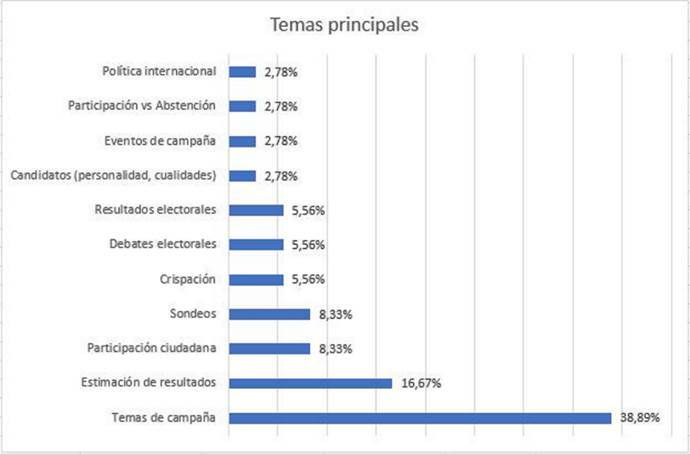 This methodological task was completed with a non-participant observation strategy, previously agreed from Spain with the Democratic Party of North Carolina, and which consisted in the monitoring of routines in the headquarters of NCDP, with special attention to the strategies of gaining the Hispanic vote, and during the two days previous to the final poll. On the other hand, non-participant observation also included the follow-up of Hillary and Bill Clinton’s final campaign ceremony (the last in the country) in North Carolina State University, and finally, of the electoral night in the Democrats’ hotel-headquarters, in Raleigh. In this sense, Mundo Hispánico allowed to continue coverage of the electoral night, with access to the zones authorized for media and confirming their work routines in such a special day. Centering the methodological strategy in the NCDP is related to the strategy of the Democrats in that State, key for their interests, where they put a lot of hopes to keep the White House. As commented before, while the NCDP designed a first level political and communicative strategy to win that State, the Republican Party did not, focusing in other States instead, although it won in the end minimally. The NCDP allowed researchers to observe routines of work, planning and organization, essentially in the communicative plane and always from the strategy of gaining the Hispanic vote in North Carolina. All this qualitative methodology allowed us to obtain relevant information from the triple axes of political information, political communication and the political action itself, and to conveniently compare and contrast all and each one of the contributions of the different sources. As Andreu Casero says, we start from the theoretical basis that “the leadership in political action is fundamental in the achievement of objectives and that media have a unique role in this sense, because journalism is conceived, a priori, as a mediator agent between citizens and political actors. This notion means that the journalistic profession must be responsible of accessing political relevant information, to elaborate it and disseminate it to the public, who otherwise couldn’t know what is happening.” (González-Esteban; García-López; Llorca; López-Rico, 2015:894). 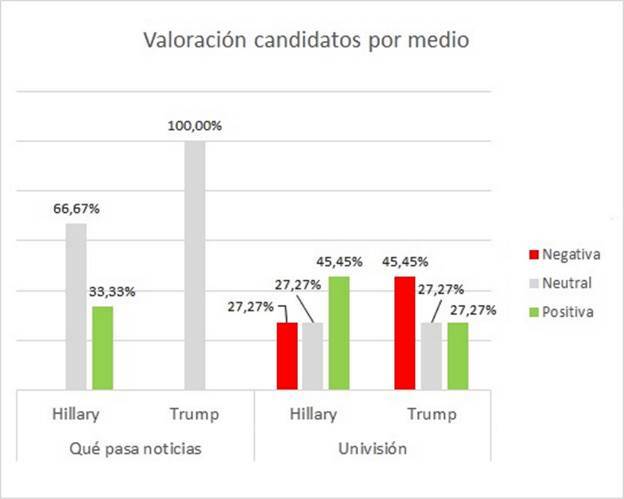 The content analysis of 35 news units in Univisión and Qué Pasa Noticias reveals the bet Hispanic media made for Hillary Clinton as their candidate. Mainly, we observe how Clinton benefits from more positive evaluations, while Trump has a majority of negative evaluations. An example of positive news for Hillary was published in Qué Pasa Noticias dated November 2: “Facebook Fans believe Hillary Clinton will win”. This manifested support on social networks and which was echoed in the media could cause a pull-effect of votes for Clinton. The evaluations of candidates were gaining relevance as November 8 approached, the day of elections. We observe how the previous day Hillary Clinton gets a 67% of positive evaluations, while Donald Trump gets 100% of negative ones. It is worth mentioning that on the voting day the positive evaluations about Trump are related to information about his victory and, in Clinton’s case, due to negative messages about her in the last campaign ceremony held in NCSU (Raleigh). Image nº3: Total evaluations of candidates in both media analyzed. Image nº4: Evolution of total evaluations about Hillary Clinton over time. In this sense, the day before elections Hillary had news with a positive nuance such as: “Jencarlos Canela says why he is voting for Clinton despite being Republican” (Univisión, November 7). However, Trump had negative news for his image before the Latino population, target public of publications analyzed: “Mexico prepares a "contingency plan" before the possibility that Trump wins elections” (Univisión, November 7). Image nº5: Evolution of total evaluations about Donald Trump over time. Image nº6: Presence of candidates in each media analyzed. 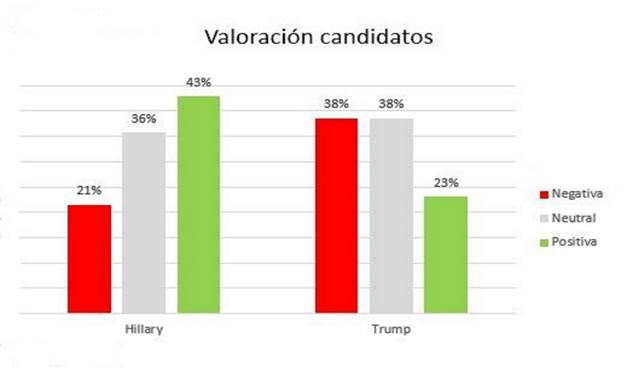 The appearances of candidates have been equal in Univisión with a 50% each one, while in Qué Pasa Noticias Clinton (60%) had more presence than Trump (40%). The informative relevance granted by Qué Pasa Noticias to Hillary Clinton is considerably higher, therefore, its bet for Clinton a priori was clear. The journalist Eloy Tuichipan, with ten years of experience in Qué Pasa Noticias and now as editor in the editorial office of Mundo Hispánico in Charlotte, considers that “It is true Hispanic media have supported Clinton in a majoritarian manner, but it is also true that the influence on electorate was not as expected.” (Tuchipan, personal interview, November 9, 2016). 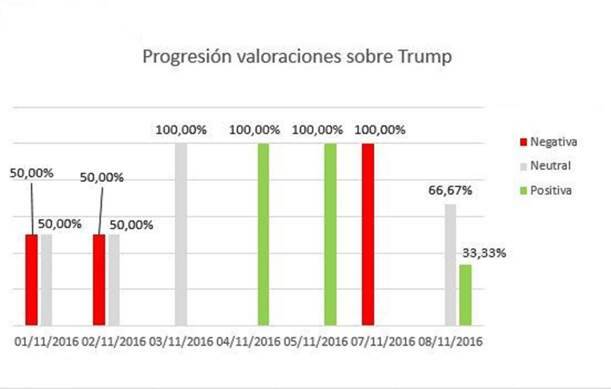 Results confirm that Univisión was much more critical towards Trump than Clinton, having the same percentage of negative evaluations (45.5%) than Clinton positive (45.5%). However, there were also negative evaluations towards Clinton (27.7%), being the same percentage of positive evaluations towards Trump (27.7%). 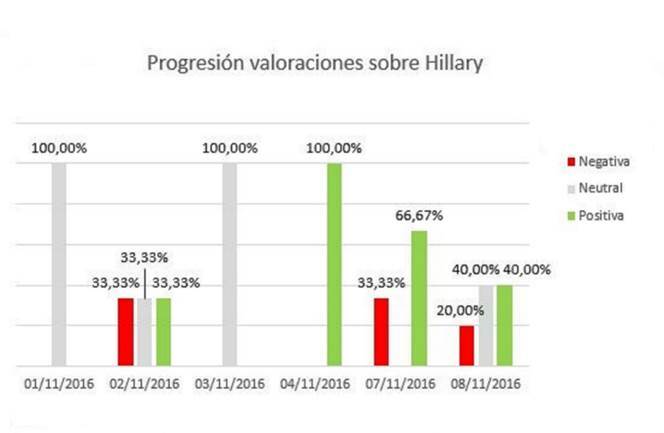 In the case of Qué Pasa Noticias, we observe how the only candidate with positive evaluations is Clinton (33.3%), and we also see that, in the last week of campaign, Qué Pasa Noticias didn’t have such a marked position against Donald Trump as Univisión. “Hispanic media have shown generalized rejection dynamics towards Trump, but a much more explicit rejection than traditional media”, states Dan Hallin, Chair Professor of Political Communication of the University of California San Diego (Hallin, personal interview, October 28, 2016. Seminar on Political Communication -Universidad de Valencia, November 10, 2016). Image nº7: Evaluation of candidates in each media. On the other hand, it is important to observe the difference of the origin of news in each one of media analyzed. 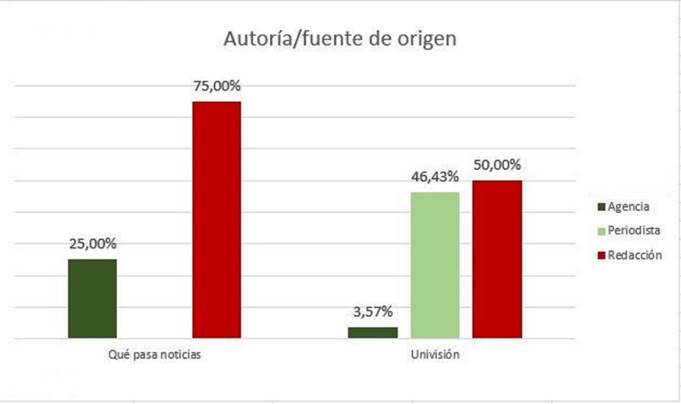 We observe that Univisión only uses 3.57% of agency news; in the remaining 96.43% there is information typical from the editorial or of one of its journalists, which demonstrates the power of this media compared to Qué Pasa Noticias, which uses agency’s news in 25% of analyzed sample. Image nº8: Authors/ source of information analyzed in every media. Image nº9: Most used genres in the sample. Most used genres were news (41.67%), video-news (30.56%) and the report (22.22%), followed by column (2.78%) and analysis of electoral surveys (2.78%) which failed in most cases. Regarding the specific themes of campaign (38.8%), there outstand issues related to problems with the polling machines, how to vote, voting schedules, etc. : “A provisional ballot can save your vote in case of problems” (Univisión, November 8) or “Until November 5, early voting will be made in North Carolina” (Qué Pasa Noticias, November 3). Followed by results estimation (16.67%), citizen participation (8.83%), surveys (8.83%), electoral results (5.56%), exasperation (5.56%), electoral debates (5.56%), etc. Ricardo Velásquez, responsible for the Hispanic section of the Democratic Party of North Carolina, considers that the awareness-gaining of the Hispanic population is key for practicing their right to vote and that Hispanic media should promote said participation approaching issues related with their daily life in a practical manner (services journalism), for instance: immigration affairs, labor law, etc. “We are just like California back in the 80’s, but the Hispanic population is becoming important and although abstention has been high, the Hispanic vote surely had something to do with the adjusted Victory of Roy Cooper as governor (Democrat) of North Carolina” (Velásquez, personal interview, November 9, 2016). Image nº10: Main themes in the sample. Professor Hallin introduces another key related with the sociological profile of the Hispanic voter: “Many Hispanics belong to ultra conservative evangelist churches, they are many and decisive and are outside the agenda of traditional media (Anglo-Saxons and Hispanics), and they vote for Trump” (Hallin, personal interview, October 28, 2016. Seminar on Political Communication -Universidad de Valencia, November 10, 2016). This expert also coincides in highlighting the already mentioned exponential increase of the Hispanic electorate in States such as North Carolina (129% between 2014 and 2032), but without being clear about whether this increase will favor Democrats or Republicans. In this same research line, the analyst Stephanie Akin cites the professor David Damore, from the University of Nevada, to ensure that the second and third generations of Hispanics with the right to vote are and will be more and more mobilized and involved in the political life of the United States, which reinforces the strategy of future researches about the issue. Media for Hispanic population still have the pending subject of the capacity to perform research journalism to really gain in quality and prestige and influence in the millions of Hispanics who live and vote in the United States. This is the opinion of the Mexican research journalist, settled in San Diego, and founder of Los Angeles Press, Guadalupe Lizárraga. “Hispanic media must win a critical reputability they still don’t have and therefore their influence is not decisive yet”, concludes the journalist (Lizárraga, personal interview, October 27, 2016). This research considers the study of a specific communicative fact: the news treatment of Hispanic media in the United States elections of 2016 in a key State such as North Carolina. In this sense, we suggested as starting hypothesis, that said media will position on the side of Hillary Clinton, therefore we performed a content analysis of two media with great presence in North Carolina. Our goal is not suggested from the perspective of sociology or political sciences; hence we have not used a methodology typical of these disciplines. The way of measuring influence of Hispanic media in the Latin vote are the results of the elections themselves. In this case and against what was expected, Hispanic voters didn’t give their support to the Democrat candidate, thus, we consider that the influence of Latin media was not what those media expected from their potential readers. It is important to mention the increase of the Hispanic population in North Carolina and, therefore, of the Hispanic electorate in the State. The fact that this is the State where this community increases the most in all United States, constitutes an opportunity to continue future research lines about this issue, in order to monitor the evolution of these specialized media, their relationship with users, and the evolution and influence in the State’s politics. The main hypothesis was argued from a fixed picture that reflected Hispanic media in expansion, clearly dedicated to the candidate Hillary Clinton, in their opinions and news; a Democratic Party reinforcing its electoral strategy in that State, aware of what was at stake in it, and attentive to a Hispanic vote considered to be fundamental in such equaled elections. Said picture seemed to predict a triumph of Democrats in a hinge State such as North Carolina and in the country as a whole, thanks to a great extent, to the support of that majority – Hispanic minority in polls. Patsee Keever herself, president of NCDP and responsible of the campaign in that State, indicated on the day prior to elections that her own Party managed their own surveys granting them the triumph in North Carolina (Keever, personal interview, November 7, 2016). The research, based on in-depth interviews to experts, in non-participant observation during the key days of these elections and in a content analysis of media object of study, rejects said prognosis, with the motive of electoral results produced on November 8, in North Carolina and in the United States. These results were not foreseen by journalists, scholars nor politicians interviewed. It is evident that Latin media bet on Hillary Clinton; however, there are differences observed between the media of State and national coverage. In this sense, Univisión has been much more critical with Donald Trump than with Clinton, to whom it dedicated the same space in a negative and positive perspective, respectively. The study evidences the partiality of these media, generally pro-Democrats, but that have emphasized their discourse due to the figure of the Republican candidate and its constant insults towards the Hispanic population collective, target public of publications analyzed. Despite this evident support to Clinton, the Hispanic participation in elections was not what Democrats nor what the surveys of Hispanic media expected. The research leads us to conclude that Hispanic media still do not influence in a decisive manner in the electoral behavior of the Hispanic population and that most of these media have a wide margin for improvement regarding organization, content quality, technological innovation, etc. Bardin, Laurence (1986). Análisis de contenido. Akal. Madrid. Keever, Patsee (2016). Abogada. Presidenta del NCDP. Entrevista realizada el 7 noviembre de 2016 en la sede central del NCDP en Raleigh (NC). Se puede consultar en audio anexo 4. Lizárraga, Guadalupe (2016). Periodista, directora de Los Ángeles Press. Entrevista realizada el 27 de octubre de 2016 en la redacción de Los Ángeles Press, en San Diego (Estados Unidos). Se puede consultar en audio anexo 3. Tuchipan, Eloy (2016). Periodista de Mundo Hispánico. Entrevista personal realizada el 9 de noviembre de 2016 en la delegación de Mundo Hispánico en la ciudad de Raleigh (NC). Se puede consultar en audio anexo 2. Velásquez, Ricardo (2016). Abogado. Presidente del Partido Demócrata de Carolina del Norte (sección hispana) Entrevistas personales realizadas el 7 y 9 de noviembre de 2016 en la sede central del NCPD en Raleigh (NC). Se puede consultar en audio anexo 5. Article received on 15 August 2017. Accepted on 19 November. Published on 26 November 2017.